Stant Racing Radiator Caps are winners on the track, competing in NASCAR and Indy Car competition. Pit Stop USA is The Online Motorsports Superstore! 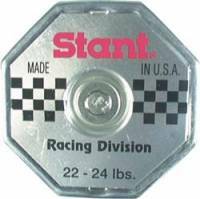 Stant products are winners on the track, competing in NASCAR races and Indy Car competition. 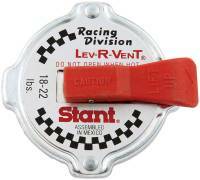 Stant brand radiator pressure caps have been on every winning Indianapolis 500 race car since 1960. Today, Stant Manufacturing Inc. is the world's leading manufacturer of automotive fuel, radiator and oil filler caps, on-board refueling vapor recovery (ORVR) valves and pressure, vacuum and fuel system testers. In addition, Stant Manufacturing Inc., also markets a broad line of cooling system components including: thermostats and gaskets produced by sister company Standard-Thomson, a subsidiary of Tomkins plc, and water outlets. 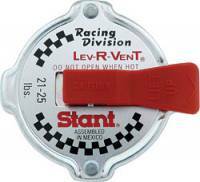 Stant offers a wide variety of radiator cap styles and applications for U.S. and import cars, light trucks, HD trucks, racing, off-road and ag equipment. The Stant Racing Radiator Caps are specialty parts for use on high-performance cooling systems. 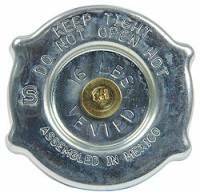 Caps are available in 18 to 22, 21 to 25 and 28 to 32 pound ranges. Caps are available for mini (32mm ID, 16mm deep) and standard SAE "A" size (2 1/8" OD, 3/4" deep) filler necks. WARNING: Stant Racing Radiator Caps are high pressure radiator caps made for use on race cars only. Do not use them on passenger cars. Pressure test the complete cooling system to the maximum level of pressure indicated on the box. Failure to test the cooling system to the proper pressure prior to installing the cap may result in damage to the cooling system or bodily injury. 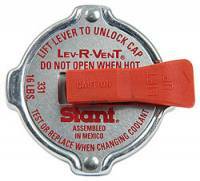 Stant LEV-R-VENTA Pressure Release Racing Radiator Caps provide a pressure release lever to safely vent the pressure prior to removing the cap. Stant SWIV-ELA Racing Radiator Caps are designed for easy installation and removal because the shell of the cap rotates independently of the upper sealing gasket, stem and bottom plate. We feature Stant Racing Radiator Caps at low everyday prices!